Mental illness does not discriminate. Do you? Mental illness and physical illnesses are no different. Just like physical illness, mental illness too can affect anyone irrespective of nationality, education, employment, or economic status. 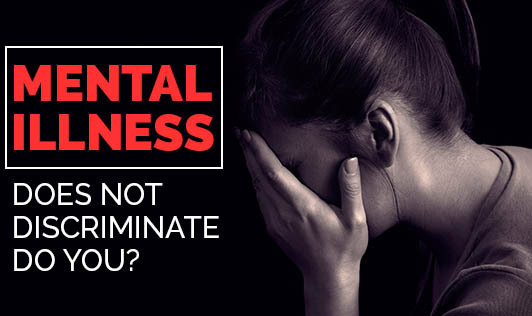 Physical illness manifests as pain and hurt and mental illness manifests as changes in one’s thoughts, mood or behavior leading to serious dysfunctions like schizophrenia, anxiety disorders, personality disorders, and addiction. The brain is simply another part of the body and these signs and symptoms and dysfunctions too call for proper treatment, support, and education just like heart disease or diabetes. Therefore, suffering from mental illness is no more shameful than suffering from any other ailment. Sadly, our society still fails to understand this fact and even today people who suffer from mental illness are ostracized, neglected, and made fun of. About 60% of those with mental illness keep away from seeking treatment due to fear of this stigma. It is quite likely that one day you, one of your friends, colleagues or family members may experience a mental health problem. So, reduce the stigma, raise awareness and be open about mental illness. Referring to someone living with mental illness as “crazy” or “insane” is hurtful. Avoid using this type of language and stop others from using it too. Eradicate the stigma. Educate yourself. Knowledge is a powerful tool that can help you dismiss your own myths and stereotypes attached to mental illness. Share this knowledge and save others from the devastating effects of stigma. Make an effort to reach out to people you have been concerned about. Call them and see how they are feeling. If there are sudden changes in their behavior or if you find them expressing suicidal thoughts ensure that they get help immediately. If you have been feeling down, stressed, or anxious, call or meet with a trusted friend or family member and tell them how you are feeling. Remember that when you speak about your experience with mental illness, you give others permission to share their experiences too. It is ‘You’, who can create a society where mental health problems are accepted and no one with mental health problems would be stigmatized. Remember, today it is someone else, tomorrow it can be you. It is time to use your voice, make a pledge, be an ally, share your knowledge and refuse to perpetuate or tolerate stigma and commit to changing your language and attitude about people living with mental illness.